As I've admitted on numerous occasions, I'm not a wargamer and never have been; I simply lack the mindset and dedication needed to become one. But I am interested in military history and always have been. When I was a child, I enjoyed reading books about historical conflicts and I watched more World War II films than I can probably remember. Consequently, I probably would have loved FASA's 1982 roleplaying game, Behind Enemy Lines -- if I'd ever had a chance to see a copy. Prior to the launch of BattleTech in 1984, FASA was a very different company -- a smaller, more hobbyist company whose products, while not as slick as what, say, TSR was producing at the time, had a lot of heart. I still consider many of their licensed Traveller products from around this period to be among the best ever produced for the game and I still look to them for inspiration. Unfortunately, smaller also meant "poorly distributed" and so I missed out on some of early FASA's more obscure products, such as Behind Enemy Lines. It wasn't until comparatively recently that I got my hands on a copy of the game and its two supplements and I'm glad I did. 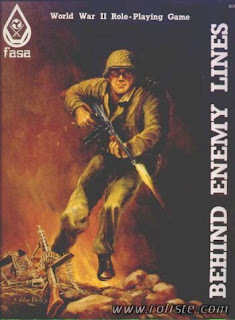 Written and largely conceived by William H. Keith, one half of the Keith Brothers of Traveller fame, Behind Enemy Lines probably wouldn't fly as an RPG today (even though, ironically, it's actually still available as a PDF). Though very much a roleplaying game and not a wargame, it's nevertheless laser-focused on its subject matter. Players assume the roles of US infantrymen during the Second World War and undertake what are essentially special operations missions against Axis forces. Their characters' skills and characteristics are limited solely to those of obvious and immediate use in such missions. There are thus no skills for social interaction of any kind (beyond Leadership), including speaking foreign languages, nor are there any "academic" skills. "Weapons Handling" is a basic characteristic, while Intelligence or some variation thereof is non-existent. Behind Enemy Lines is very much a single-minded game and its mind is on commando missions during World War II. Within its limited scope, however, Behind Enemy Lines really delivers, however. Many important subjects, from sighting to weather to artillery fire to demolitions and more are called out and given an appropriate level of rules detail, which is to say, treated more comprehensively than many RPGs do but not so much as to make using these rules a chore. Even more interesting to me is that one of its three integral books (Behind Enemy Lines was released as a three-book boxed set, along with maps and counters) consists of 48 pages of event tables. These tables are essentially the World War II equivalent of "wandering monsters," providing the referee with the guts of adventures, as the characters sneak their way across occupied territory on their way to complete a mission. The tables are remarkable in their specificity: you get tables for different terrain types, as well as lookout posts, fortifications, railroads, farmhouses, etc. Armed with these tables, a referee could easily create obstacles on the fly and there are enough of them that'd be some time before he ran out of entries. If Behind Enemy Lines has a serious flaw, it's, as I said, its laser-focus on its subject matter. This is not a game about roleplaying during World War II, despite its subtitle. It is a game primarily about playing out a very precise sub-set of military missions during the Second World War. Within that scope, it's a well presented and researched game and I think it'd comparatively easy for a referee to run it satisfactorily just with the materials included in the box. But if one's interest is broader or even just as specific about another aspect of World War II, I'm not sure that Behind Enemy Lines would be of much use. There's evidence that FASA intended to expanded the game beyond its original focus, but they never got the chance, probably due to its unpopularity. I've never met anyone who actually played the game back in the day, but, as I also said, I never even saw the game until quite recently. My guess is that, like many games in the first decade of the hobby, Behind Enemy Lines was a labor of love, a pet project by its designers that simply never found an audience. I don't exactly mourn for the game's lack of success, because, truth be told, even with my interest in military history, it's not the kind of game I'd be likely to play. At the same time, I do mourn, at least a little bit, for the days when game companies would release a game just because someone at the company was in love with a particular idea and wanted to run with it. That kind of passion is always valuable. Would it be fair to say that those who play this game are gonna be doin' on thing an' one thing only: Killin' Nazis? Not at all. In fact, many of the game's missions would probably go more smoothly for the PCs if they don't kill anyone. I picked up the pdf of this a couple years ago. It was great resource in helping me design a set of WWII skirmish rules for minis, which probably underscores the laser-tight focus you mention. If you are a WWII nut (as am I when wearing another hat) it's actually a quite well done little package of background, small weapons details, and interesting scenarios. And as far as "killin' Nazis", well it would be a mighty fine engine for recreating Inglorious Basterds indeed. "And once we're in enemy territory, as a bushwhackin' guerrilla army, we're gonna be doin' one thing and one thing only..."
I did buy a copy of this when it appeared, and we played the Guns of Navarone adventure. It's an interesting set of rules; there's some clunkiness, and it's obvious that Traveller was an influence, but it offers some clever solutions to the unique problems of its genre. Guns of Navarone was perhaps a poor choice for an adventure because so many players are familiar with the movie, which means they KNOW that one of their allies is going to be a traitor. Still, we had a good time for the few sessions we spent with it, and we got to play with toy soldiers. "If Behind Enemy Lines has a serious flaw, it's, as I said, its laser-focus on its subject matter. This is not a game about roleplaying during World War II, despite its subtitle. It is a game primarily about playing out a very precise sub-set of military missions during the Second World War." I'm not quite sure what this means. If you're playing a WWII RPG of any type, shouldn't there be a heavy focus on combat? Especially commando style 'Dirty Dozen' or 'Guns of Navarone' style missions as, it seems to me, those would work better in an RPG than a standard battlefield type scenario like 'take that hill.' Just curious, what other type of role-playing would you expect in such a game? Thanks. If Behind Enemy Lines has a serious flaw, it's, as I said, its laser-focus on its subject matter. And yet, if it came out today, it would probably be one of those clever indie-type games, most of which seem to have a similar focus. It's interesting how things change. Spot on, Kelvin! Spot on. Most older RPGs were pretty broad in their focus. Even D&D, which is famously derided as being solely about dungeon crawling, was never just about dungeons and included rules from the start for wilderness and naval adventures, as well as building fortresses and ruling domains. Traveller too is similarly open-ended. For my money, a "World War II RPG" needn't limit itself to a single type of military mission as its focus. I think the game could have covered a lot more ground in the initial boxed set than it did, even if it stayed focused solely on military matters. It'd have been nice to have included the possibility of playing spies or partisans, for example, both of which are important parts of the "mythology" of the Second World War. Yep -- and that speaks to one of my biggest criticisms of most indie game designs: they're too narrow in their focus for my tastes. I like my games expansive. I played the hell out of this back in the 80s. We never ran single PCs; it was always multiple characters to flesh out a squad and because of the high lethality. I liked the maps that came with it, too. And some of those adventures are classics. Even the shorter "incidents" like the Pillbox on Hill 409, or Deadly Crossfire. I also played this back in the day (and still have it today). The laser-tight focus was the real advantage to my group back then; we wanted combat and nothing else. This may also have been because many of us were wargamers first and RPG players second (our RPG of choice being Traveller). Being WWII the whole "morality" issue was also side-stepped - we were the good guys and the NPCs were the bad guys. Some of our games were simple (seize the crossroads) or more complex (blow up the guns before the invasion comes ashore). "Most older RPGs were pretty broad in their focus. Even D&D, which is famously derided as being solely about dungeon crawling, was never just about dungeons and included rules from the start for wilderness and naval adventures, as well as building fortresses and ruling domains. Traveller too is similarly open-ended. "For my money, a "World War II RPG" needn't limit itself to a single type of military mission as its focus. I think the game could have covered a lot more ground in the initial boxed set than it did, even if it stayed focused solely on military matters. It'd have been nice to have included the possibility of playing spies or partisans, for example, both of which are important parts of the "mythology" of the Second World War." Ah, those are good points. Thank you. And my joke gets quietly ignored. Bah. T2000 was a far better "militarized" RPG than BEH. Had MANY Hours entertainment with that than this old gem. But, it was a good effort for what it portrayed - but didn't get the support which would have made it a better product. I just found a copy of this game in my garage, and want to sell it... anyone interested...?? Why Even Try to Fight It? The Eld -- in Living Color! Have Spacesuit -- Will ... Um?